She trips over a speck of dust and drops to the floor in a clatter of kneepads and wristguards. Blushing, she looks around the rink, hoping no one has seen her tumble. The girl smiles. And the next time she falls at this practice for the Atlanta Derby Brats in an echoing warehouse in Norcross, her cheeks don’t redden. She just gets right back up and keeps trying. 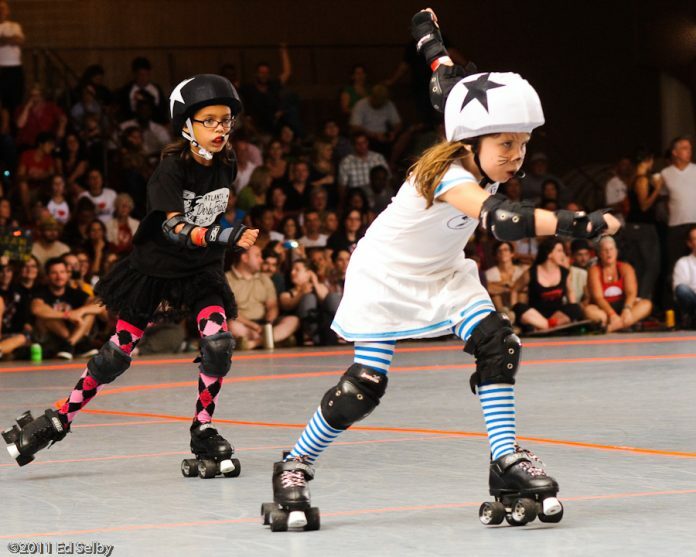 She’s a newcomer to the Atlanta Derby Brats, a roller derby league founded in 2010 that teaches girls aged seven to seventeen to skate, fall, block, hit, cannonball, pass, lap, and compete like the real Atlanta Rollergirls. Derby Brats founder Angela Ward—who also founded the Atlanta Rollergirls and is known as “Tanya Hyde”—wanted to create a Little League-type program to secure the future of the Rollergirls program. In doing so, she realized that the feeder team could also help girls build their self-esteem and their fitness while seeing that athletes come in all shapes and sizes. The Brats are trained by seasoned Rollergirls like “Hate Ashbury,” also known as Michelle Brattain, and compete among themselves and on a traveling team. When they hit eighteen, they have to leave the Derby Brats, and they can’t try out for the Rollergirls until they’re twenty-one. In the interim, they can skate in a recreational league. Chica Morgan’s daughter tried soccer, rock-climbing, and several other sports but never wanted to go back after the first day. Then she found roller derby. Morgan’s daughter gave herself the derby name “Animaim.” Her best friend is “Crazy Horse,” another twelve-year-old Derby Brat from Decatur. Crazy Horse’s little sister is ten, and skates under the name “Swamp Monkey.” On a recent Saturday she tried to hide in her mother’s car so that she could go to skating practice instead of to a school-friend’s birthday party.